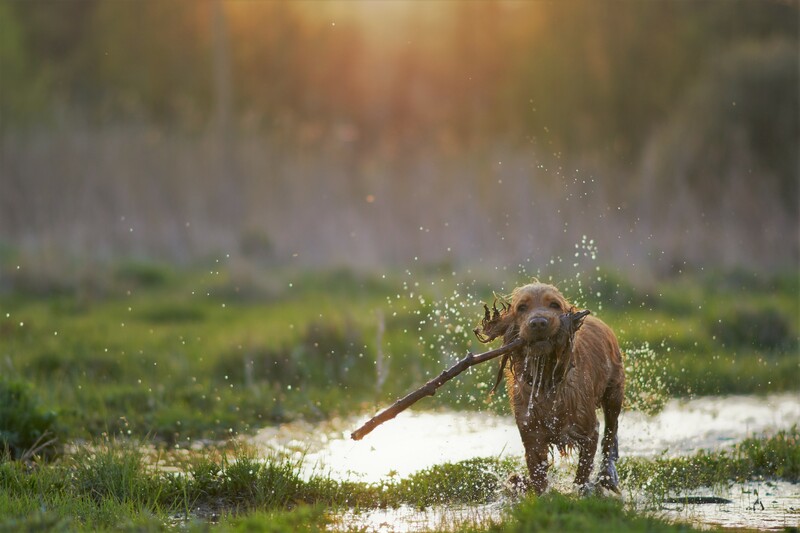 Traditional veterinarians offer lots of services for our furry family members, from teeth cleaning, vaccines, pain relief prescriptions and surgery. One thing that you most likely have not seen in a vet clinic is acupuncture treatments for your pet. With growing alternative therapy awareness in the medical and veterinary fields, this could change, and has changed in Asheville, NC thanks to Beth Hampton Jones. It all started when I was on the hunt for a new gourmet treat for the Pet Treater Box. I looked in Johnson City (Where our headquarters is located) to see what I could find, and I really hit a wall. I ventured a little further to Asheville, NC, which is about an hour away through the Appalachian Mountains, where I found the cutest dog bakery called Three Dog Bakery. Not only did I find amazing gourmet dog treats, I found an entrepreneur offering alternative therapies, vet services and more under the same roof! Being curious about acupuncture for dogs, I set up an interview so that I could share with you. Q: Beth, how did you find yourself as an acupuncturist for animals? Did you always know this is what you wanted to do? A: I have always been a very Type A personality and knew from a very young age that I wanted to be a Veterinarian. I had a pretty rigid plan from early on, so it took awhile for me to open my eyes to other less traditional options. I practiced at and owned a traditional three -vet clinic in a rural NC town for 20 years. After becoming somewhat frustrated with the treatments that I could offer, I branched out and decided to get trained in acupuncture. That was 14 years ago. Q: How did you end up in Asheville, NC? A: I am originally from Asheville, NC. While in the rural town, I ended up running for NC senate. During this time, I started to really realize that the place where I was living and the way it affected my work and life, wasn’t allowing me to do my best work and be my happiest. There is no doubt I wanted to be part of the community and make a difference, but it was time to move on. I sold my farm and decided to move back to my hometown. Q: As for the acupuncture, how would you explain this medical method to someone who has never experienced it before? A: When I first started practicing animal acupuncture, I knew it was useful but did not really know what I was getting into. The simplest way to explain it in basic terms is: the placement of needles into specifically mapped points on the body. These points are defined anatomically, and are chosen based on what effect is desired. The insertion of the needle is, at the basic level, to produce an effect such as: pain relief, increased circulation to a needed area for healing, behavior modification, and many other conditions. The Traditional Chinese explanation and description of acupuncture includes meridians and moving Qi (energy) to remove stagnation and bring about healing. The Western Scientific description focuses on explaining this method in medical terms. This way would explain how the needle placed in the muscle causes increased blood flow to that area, carrying white and red blood cells, producing a desired effect. It also involves stimulating nerves and the conduction of neural signals. Other methods included in acupuncture are injections made to specific sites and heat application. The heat application is done through moxa, a cigar shape bundle of compressed mugwort, that is lit on fire and then held at the end of the inserted needle. This bring heat through the needle down into the acupuncture point. Q: What is this heat method best for? A: This is great for older dogs who have sore hips or arthritic joints that becoming increasingly sorer during colder months. 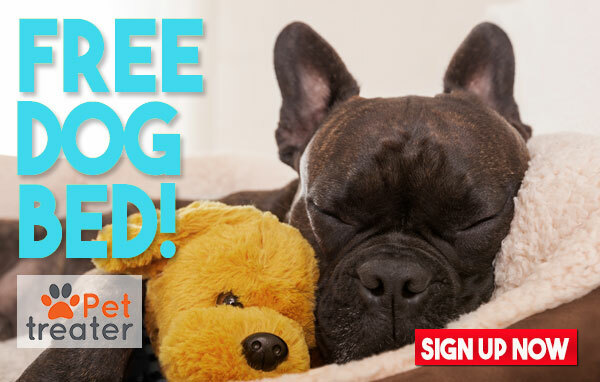 Sign up for Pet Treater and get a FREE bed with your first box. Use Coupon Code PT-BED at checkout! Q: How does someone know when to seek acupuncture for their pet? A: Well, this has changed in the last few years. When I first started, people would seek our help when all other methods had failed. This put me in a tough place. Now, more and more, people are pairing acupuncture with other therapies and medications. This helps with pain relief through the whole process and can slow down progression of conditions. 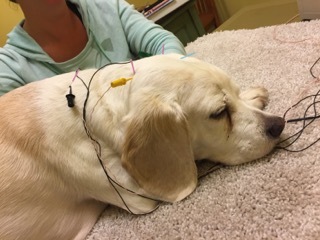 The sooner a pet owner seeks out acupuncture therapy for a problem, the better the chances of providing healing and stopping the progression of the disease. I also pair acupuncture therapies with supplements and Chinese herbs. Q: What can someone expect when they bring their dog in for a treatment? 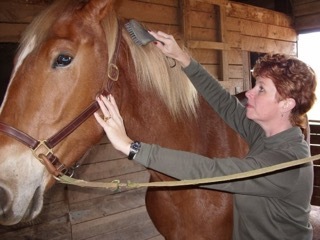 A: The first visit at Asheville Animal Acupuncture starts with an exam. This is a time when I learn about the dog and the medical history. Keep in mind, I do not have any other dogs or people around, so the dog is able to roam freely while we chat. I then use cold laser therapy before starting with the needles. The needles are placed in order of the least likely to be uncomfortable first. This gives me a chance to understand the dog’s tolerance to needles and how to proceed to keep him comfortable. By the end of the first appointment, most every dog is able to relax, and some even fall asleep. Remember that essential oils are very potent, and dogs sense of smell is very strong. Put about 1/5 tsp of jojoba or sweet almond oil in your palm. Drop 1-2 drops of lavender essential oil and rub your hands together. Using your fingertips, rub the mixture onto the dog, working toward the skin, avoiding the face and head. Using medical grade essential oils like these, can reduce risks in case your dog ingests a bit of the oil. 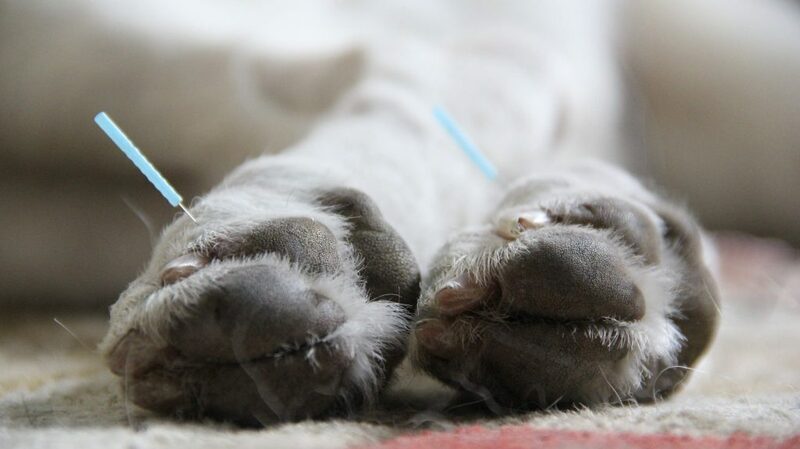 Q: What are the top three conditions in dogs that you treat with acupuncture? Q: Do you have a success story you can share? A: I have so many, but one sticks out in my mind. Jackson, a Dachshund, was always a little grouchy. He would always bark and have a little attitude when he came in to the clinic. Well, his owner brought him in one day after they had been in an emergency clinic overnight. Jackson’s back end was paralyzed from a slipped disc. Within two treatments, the acupuncture allowed him to actually get up on his legs and walk again. It was pretty remarkable. Over time, we became buddies, and I was the only one he was cool with! Q: Being in Asheville, practicing acupuncture for animals, how did the Three Dog Bakery become part of your story? 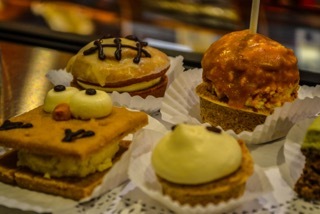 A: The bakery had been in town for about 12 year and was always one of my favorite places to go. I had been searching for ways to make my practice more economically possible, and I walked into the bakery one day and saw a for sale sign. I thought to myself, this could work! I ended up buying the bakery last November, and I set up my practice for acupuncture in a separate room. It really works out because the people that are coming in to buy gourmet dog treats are the same people who will explore alternative treatments for their pets. 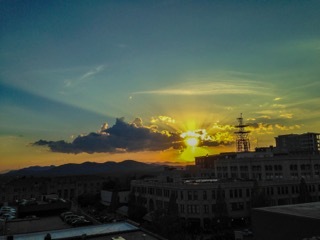 Asheville is such an amazing place, and the downtown business owners are extremely kind people! Q: Are there any businesses in particular that have been helpful in your transition? A: Local Asheville businesses are working to earn the distinction Dog City, USA. 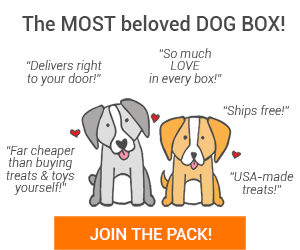 This includes some amazing marketing, a city map with dog friendly locations marked, as well as training for business owners on how to manage the presence of dogs in their stores. The trainer/behaviorist, Kim Brophey, also owner of The Dog Door, is spearheading this effort! The owners of Kilwin’s across the street from me have also been amazing! The Bee Charmer offer my cookie coupons to customers, and Battery Park Book Exchange and its owner, Thomas Wright, have an amazing pet friendly wine bar that also promotes Three Dog Bakery. The culture downtown is so amazing! Share your story or product!~ Email [email protected] for a chance to be highlighted or interviewed.